Despite the hint of a link with a famous designer (Humphry Repton – great East Anglian and contemporary of Jane Austen – may have worked here), the grounds at Kentwell are not what one might class as a Great Garden in the same way as Stowe or Kew, or to get nearer the period, Hampton Court; there are no grand design gestures here. But they do provide a perfect setting and backdrop for the red brick, moated Tudor manor house. What Kentwell doesn’t have in grandeur, it makes up for with variety: of forms, of textures and of age. Elements from every period right up to the present day are clear to spot; the late medieval service wing and ancient ponds next to Pottery Wood, the Tudor house, the Stuart canals which form the outer moat, the Regency cedars, and the Victorian shrubbery sit alongside modern elements. What is wonderful about the gardens at Kentwell is the way that the present owners, (who rescued the hall and its setting from dereliction in the 1970s), have added idiosyncratic details entirely in-keeping with the more than five hundred years of garden history embodied in this site. To say it is whimsy at its best, is certainly not intended to be disparaging. Many features such as the carved cedar inspired by the Tower of Babel and the yew castle are indeed whims of Peter Philips, the owner. 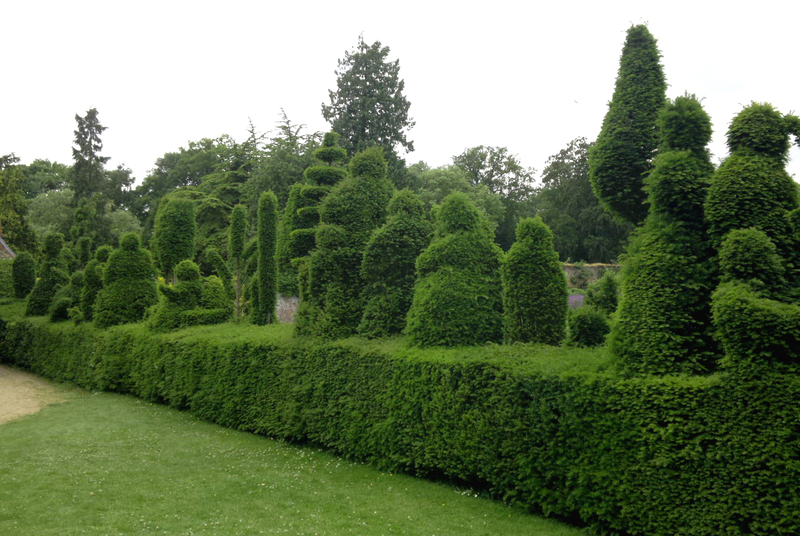 Perhaps my favourite contemporary feature is the Pied Piper topiary, created by his wife, Judith. I suspect it is unique and it works brilliantly when reflected in the moat. The gardens were in fine form when we visited at the end of June, at their best in fact. The inner moat, which entirely surrounds the house, and the outer moat that encompasses much of the rest of the garden, ensures that there is water almost everywhere one looks; and as the Georgians knew, water always ‘lends enchantment to the view’. 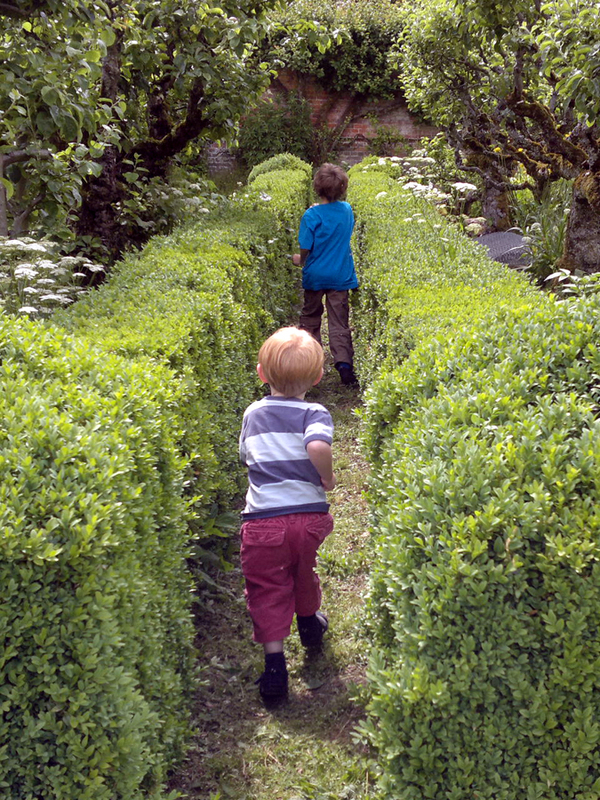 My children would have been happy merely running around exploring the gardens, diving down little paths, impatient to see what delights and surprises awaited them around the next corner, following the cry of the peacock to track him down at last. 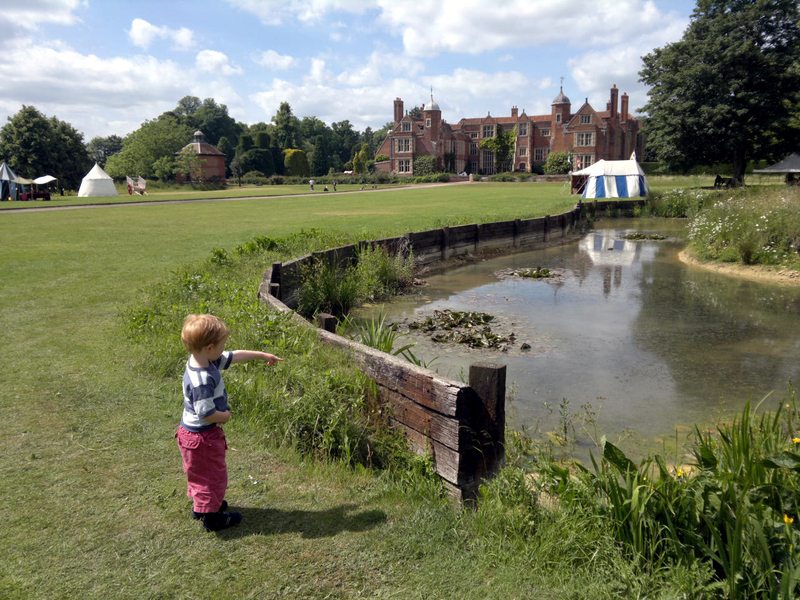 But on this visit Kentwell provided more than a trip to an interesting and attractive place to explore, it gave us the opportunity to be Time Travellers. 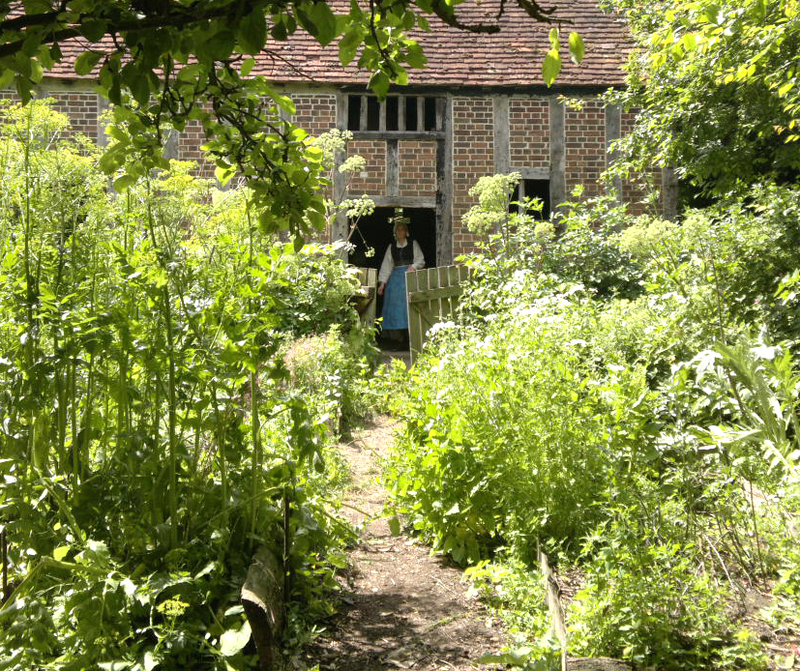 I may be wrong, but Living History just did not exist when I was a kid back in the 70s and 80s and the Philips family at Kentwell were pioneers of this sort of experience. I must have been around ten when I first visited, which would make it early 1980s. It was captivating then, I think it is even more so now. The Kentwell Re-creations are so much more than a tableau vivant. With over 250 re-creators living out every element of Tudor life, from every strata of society, over a wide area, you can immerse yourself. 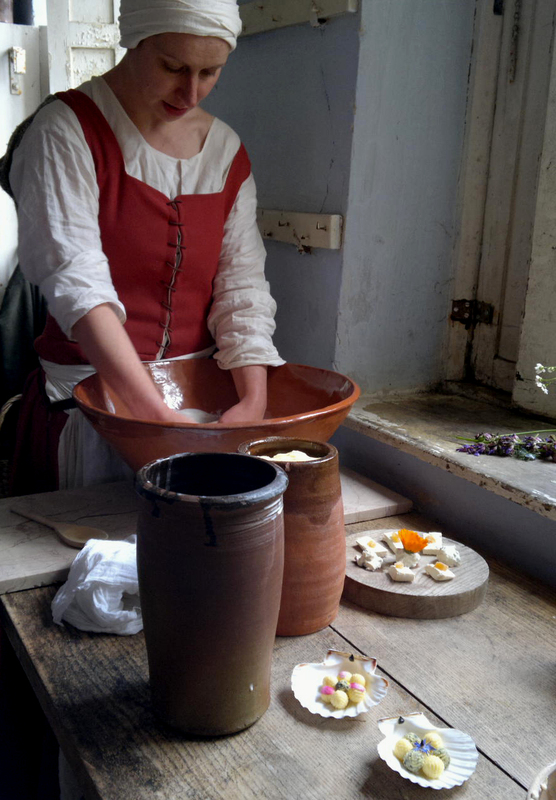 You get to interact with Tudor life in all five senses and nothing is so evocative as smells and tastes. For me it was so powerfully real that I had no difficulty in slipping into Tudor English and the experience was so intense that I dreamt about it vividly that night. The children were captivated too. The seven year old enjoyed learning sword fighting skills and was entranced for far longer than I would have expected by the discourse of one of the archers on the different sorts of arrows and their uses. Both he and his younger brother loved the school room and interacting with the child re-creators. The multi-generational aspect is a truly authentic detail and I was charmed by four year old Alfie of the Cot, who was having some trouble remembering he was living in 1559 not 2013 and told me the best bit of the day was having chocolate for breakfast! I adore the elements added since I last visited in my teens. The fact that you must exchange your modern money for Tudor pennies and groats which you can spend with the peddlars selling plums, biscuits and marchpaine (marzipan) scattered around the grounds, as well as in the Turk’s Head ale house. This year the children were delighted to be able to play simple Tudor pub games chalked onto the tables, while munching their hot coffins (like pasties), or excellent bread and cheese and quaffing their apple juice, (ale for the grown ups). The ale house is part of a series of modern buildings, erected in recent years in a Tudor style by the Philips family as a back drop for the re-creations. As well as barns, hovels and cartsheds, the complex includes a cot, complete with 16th century cottage garden, which is probably more authentically Tudor than that around the house. This is the second year I have taken my second generation of Kentwell appreciators there. It is a very long trek for us, but it definitely has the makings of an annual pilgrimage. This entry was posted in Uncategorized and tagged East Anglia, Hampton Court Palace, Humphry Repton, Jane Austen, Kentwell, Kentwell Hall, kitchen garden, Pied Piper, time travellers, Topiary, Tower of Babel, Tudor, Tudor re-creation, Tudor re-enactment. Bookmark the permalink.